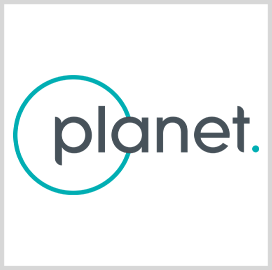 Planet received a $6.7M contract to provide Earth observation data to support NASA-backed climate research projects, SpaceNews reported Thursday. Up to 35 research programs will use datasets from the company to determine if commercial data can augment information the agency collects through the Moderate Resolution Imaging Spectroradiometer, Global Ecosystem Dynamics Investigation and the second Ice, Cloud and land Elevation satellite. Jen Marcus, vice president of Planet's federal operations, told SpaceNews the contract indicates NASA’s interest in how commercial imagery can support scientific missions and “how it coexists with other datasets." The company will provide data from its Dove, RapidEye and SkySat systems. “Getting our data into the hands of renowned climate scientists to help measure essential climate variables furthers our mission of providing timely, global imagery and analytics to empower informed, deliberate and meaningful stewardship of our planet,” Robbie Schingler, Planet co-founder and chief strategy officer, said in a statement.